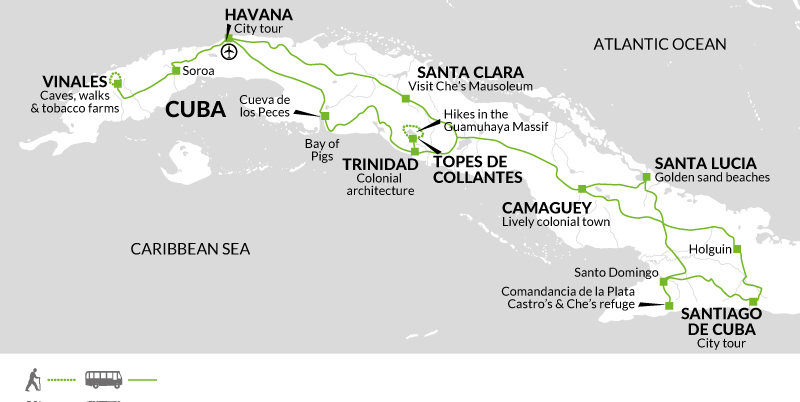 In Cuba we take the chance to visit the lesser known destination of Topes de Collantes where we sleep under the stars and stay at a couple of haciendas hosted by the local community. They cook wholesome local food for us and also provide the guides that we use on our walks in the area. By staying at the haciendas we support local people directly and use minimal resources when compared to staying at a hotel. The night in the haciendas is always listed as a highlight of the tour by our customers as they have a chance for interaction with the locals, which is often much harder in larger cities. In addition to the above, we are continually looking for ways to improve and are proud to be ‘Responsible in everything we do’. Education is key, and so all staff, Tour Leaders and partnering suppliers are trained in responsible and sustainable tourism. At our Head Office, we continually strive towards a sustainable and planet-friendly working environment, including having solar panels installed and a company commitment to reducing our plastic usage. As well as this, we have valuable and longstanding partnerships with UK charities Toilet Twinning and Send a Cow, plus many smaller initiatives and projects around the world. We’re members of UK travel industry bodies Tourism Concern and AITO because we believe it’s important to share our knowledge and experience, as well as learn from other operators. Operating outside of the large state-owned hotels in Cuba is difficult, because the government controls much of the tourist infrastructure. However, where possible we use locally owned and run ‘casas particulares’ (homestays), where we stay with a local family who can supplement regular incomes with money through privately letting rooms in their house. We also encourage our groups to eat in small Paladars run by the locals. Due to food rationing, food is more limited in the Paladars compared to the hotel restaurants, however by eating in them it not only supports the local economy but also gives our customers a real insight into the realities of Cuban life. everything works all the time in Cuba. Walking and meeting the locals in the region of Viñales.